Okay, this is kind of hilarious. 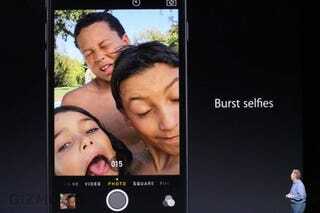 The new iPhone 6 has burst mode for selfies. Hello narcissists! Burst mode, for the uninitiated will take several photos with one push of a button. This joins a number of other features that make the iPhone 6's camera better than ever. The lens is the same with an 8MP iSight camera, true tone flash and a f/2.2 aperture, but it has a bunch of manual controls, an improved image signal sensor, and digital image stabilization. But perhaps most importantly, the new iPhone's selfie burst mode leaves you with the question, why take one selfie when you can take one hundred?